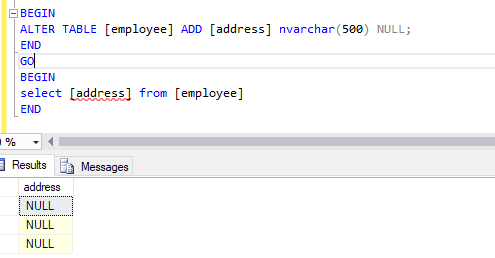 In this blog, we will look into accessing a newly-added column to a table. We can add a new column to an existing table. Similarly, we can drop a column using following code. We can change the data type of an existing column. This error is because the newly added column will be reflected only after completion of the current batch. To fix it, we can split it into two different batches separated by batch separator [GO]. 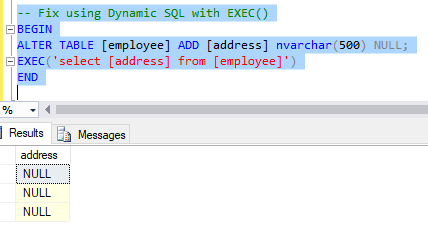 We can also use dynamic SQL instead of splitting into two batches as shown below. I attached SQL script and am ending here. I hope this is informative. SQL Server 2016 Hosting – HostForLIFE.eu :: How to Update Table View in SQL Server? SQL Server 2016 Hosting – HostForLIFE.eu :: How To Pass Output Parameter To Stored Procedure In SQL Server?